After a long slog around Kyoto station trying to find souvenirs besides yatsuhage, dolls, handkerchiefs, or the other usual knickknacks and paraphernalia usually associated with Kyoto, I stumble across this shop in Isetan Department Store Kyoto on B1F. Isetan department store is well known across Japan, with branches in Niigata, Shinjuku, and this Kyoto branch among others; however, I don’t know if the other stores had such a wide alcohol range. The arrow points to the spot where you can find the good stuff. The alcohol section in Isetan Department Store Kyoto, well the one of many, but THE one you want to go to is on the B1F at the back, hidden behind snacks and cakes and a moving throng of people that seeming to be going somewhere though exactly where is not known as they just seem to be moving around aimlessly. Get through them though and you end up at the pot of gold. A wide and varied range here. There was a wide selection of beers, though nowhere near as many as Yamaoka. Kyoto Machiya & Kizakura Kappa Country were on sale here along with some obscure Kizakura Egyptian beer line, along with a Kyoto Machiya-Isetan mashup, with others from Hokkaido, Osaka, Kanto, and even Nagano too. Prices were pretty much the going rate though some the obscure beers of Tazawako and Hokkaido Onibestu were nice to see. 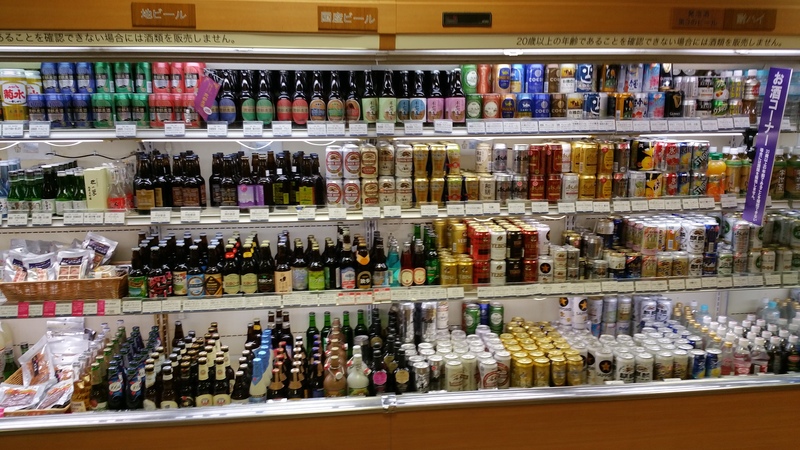 The manager mentioned that the only beers they stock all year round are the Kyoto range of beers so there is a good selection throughout the year. I was there a couple of times and always found a lot of different beers, very interesting. But today, it was quite a disappointment. The craft beer section seems to have shrunk. As usual, all the Kyoto beers were there, but except for that I saw two Coedo beers, four from Kinshachi, the usual cans from Yonayona and Ginga Kogen, and that was it. Not sure what has happened. Thanks for this post! Just been in Kyoto in for the last couple of days while on holiday in Japan from the UK, and have been trying to sample as much local craft beer as possible and knowing this was here was a real help. Pleased to report it’s still there and we’ll stocked! Great to hear that, Luke. Did you try any of the bars in Kyoto?